1.Thursday, May 11, 2017-Leave Washington Dulles for Amsterdam on United Flight 946 (Boeing 767-400, Business Class) at 5:20 PM (Jim). 2.Friday, May 12-Arrive Amsterdam (3,867 miles) at 7:15 AM. Banks Mansion Hotel. 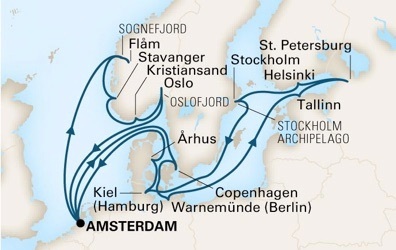 4.Sunday, May 14-Depart Amsterdam on Holland America ms Koningsdam at 4 PM. 7.Wednesday, May 17-Arrive Stavanger, Norway. 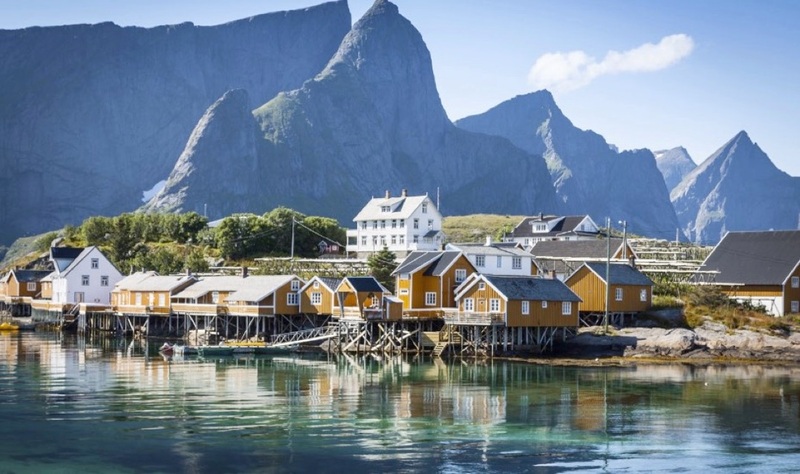 Cruise through the Stavanger Archipelago for an overview of how the Norwegians live in this area, with plenty of small idyllic islands and many holiday homes by the sea. A guide will accompany and point out various attractions along the way.In splendid Lysefjord, discover one of Norway's spectacular natural wonders -- Pulpit Rock. This promontory juts more than 1,500 feet above the sea, and we will cruise directly under it. In this beautiful fjord, the water surrounding is as deep as the mountains are high. Stop en route in idyllic surroundings for a snack of coffee and waffles, served in traditional Norwegian style with sour cream and jam. Depart at 6 PM. 10. Saturday, May 20-At sea (Jim). Leave Washington Dulles for Amsterdam on United Flight 946 (Boeing 767-400, Business Class) at 5:15 PM. Arrive Amsterdam (3,867 miles) at 7:15 AM on May 21.(Vicky). 12. Monday, May 22-At sea. 15. Thursday, May 25-At sea. 16. Friday, May 26-Arrive Tallinn, Estonia at 9 AM. Asmall-group outing (maximum 15 guests) goes first to Tallinn's beachside region of Pirita. This place may bring back memories of the 1980 Olympic Games, held here at the yachting complex. See the 16th-century ruins of St Bridget's Convent and the Song Festival grounds. At Tallinn's Old Town, disembark the motor coach at Tall Hermann Tower; then walk up Toompea Hill to Palace Square. The Baroque palace at the top is now the seat of the Estonian Parliament.Visit the outstanding Russian Orthodox Alexander Nevsky Cathedral, complete with gorgeous mosaics and icons, dominating the Upper Town's skyline. Narrow cobblestone streets lead to the Gothic Dome Church (St Mary's Cathedral). Step inside to see more than one hundred Coats of Arms on display.Look out over the rooftops of the Lower Town from a scenic viewpoint before walking back to the motor coach. Depart at 5 PM. 21. Wednesday, May 31-At sea. 25. Sunday, June 4-Disembark in Amsterdam at 7 AM. Leave Amsterdam on United Flight 947 (Boeing 767-400, Business Class) at 12 PM for Washington Dulles. Arrive Washington Dulles at 2:35 PM (3,867 miles).